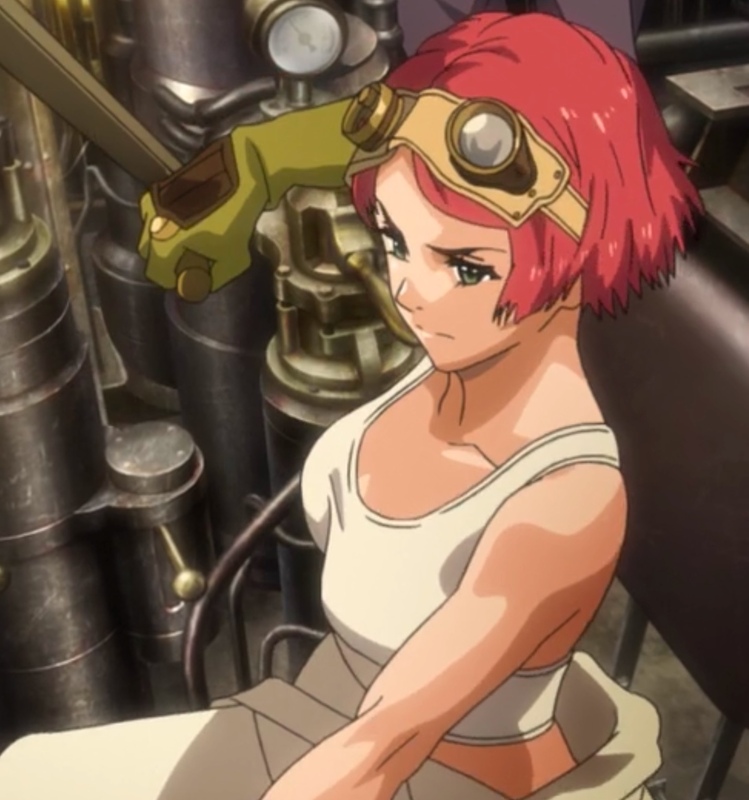 In Gathering Light, the sixth episode of Kabaneri of the Iron Fortress, Mumei comes face to face with her limitations; Ikoma shocks everyone when he tries to fight alone; and Sukari does the unthinkable: he proves that he’s sometimes good to have around! Mumei remembers the face of a comrade — just before another comrade shot her in the fact to prevent her from becoming a Kabane. Capture from the Amazon Prime stream. Mumei remembers being in the field, seeing a woman solider, apparently from her team, pleading for help as her arm bleeds from a Kabane bite. Another solider shoots her. Mumei’s brother looks on silently and tells them to get moving. Then Mumei regains consciousness only to find that she’s trapped under rubble. Her face begins to glow with orange veins. Try as he might, Ikoma can’t free her, and Mumei tells him to leave her. Of course, he doesn’t. The huge creature from the last episode chases the the Koutetsujou, which manages to retreat to a shelter within the station. The community “leaders” who advocated for getting rid of the Kabaneri before are at it again, this time in retaliation for the plan going badly. Ayame resists with the support of Kibito and some of the other bushi. They try to come up with another plan while Sukari studies a map. Mumei continues to argue with Ikoma until her heart begins to glow brightly and she start to panic in fear that she’s about to become a Kabane. Fortunately for her, Ikoma had brought a vial of blood with him. He hears the advancing Kabane and promises to come back to dig her out. She slips back into unconsciousness. Can Ikoma protect her? Will the Koutetsujou come back for them? What will they do about the huge creature made up of hundreds or thousands of Kabane? Mumei relives a memory: a woman, presumably her friend, dressed as a solider like Mumei, pleading for help. The woman’s arm bleeding from a Kabane’s bite. A hulking soldier coming up behind her and blowing out her heart. Her brother arrives on a horse and his hair blows in the wind. The message seems clear: the weak die, relentlessly. 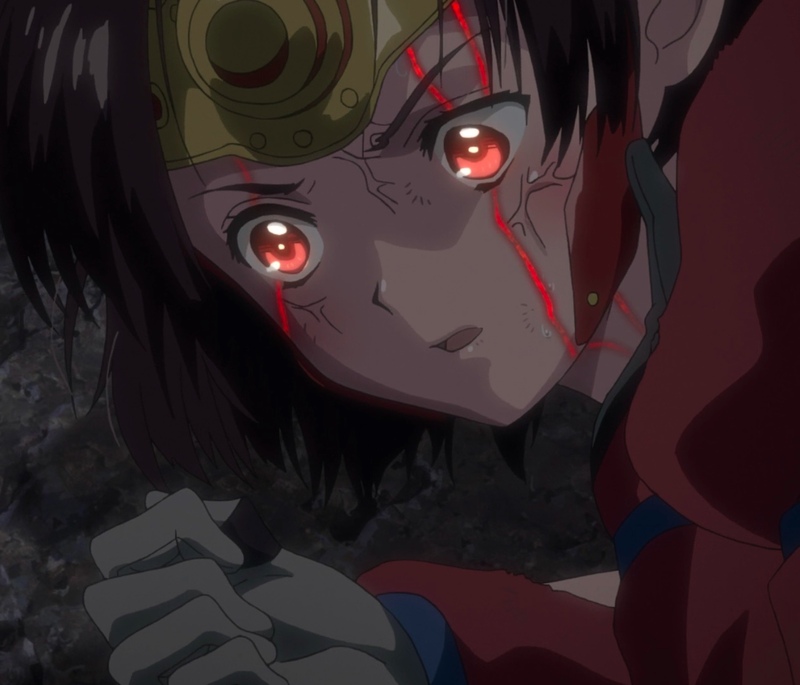 Trapped under the rubble, unable to free herself, Mumei experiences a moment of panic. Capture from the Amazon Prime stream. Mumei awakens and finds she’s pinned under debris from the cave-in. She can’t free herself. She feels the red pulsating veins appear on her face and she begins to panic. The titanic collection of Kabane chases the Koutetsujou as it tries to retreat. Yukina manages to eek out enough speed to get the train into a shelter as the bushi drop the shelter’s door. The creature slams into the door and melts away back into Black Smoke of Kabane. And we’re not even two minutes into the episode yet! Ikoma returns from scavenging for tools and discovers Mumei’s awake. For the first time since he met her, she admits she’s in pain. She also says he can go ahead and blame her for all of this, and he readily admits her decisions didn’t help; but neither did his. He’s convinced the folks in the Koutetsujou are ready to leave them both behind, given how badly the two of them screwed up. Rather than despair, though, Ikoma says they need to survive, escape, and make things right. But no matter what he tries, he can’t free Mumei. Back in the train, the council of whiners is acting out Ikoma’s fear: they’re trying to convince Ayame that their predicament is all the Kabaneri’s fault. The humans should use the occasion of the Black Smoke of Kabane’s temporary dissipation and escape, even if the collapsed tower is only half lifted off the track. But the situation isn’t as it was before. Too many of the bushi saw how Ikoma and Mumei saved the train. Even Kurusu, who’s no friend of the Kabaneri, looks disgusted by the whiners’ idea. The whiners press their argument, saying that Mumei and Ikoma deserve what they got because they made mistakes. Ayame finally rejects their arguments. In the back of the room, not participating in the discussion, Sukari studies a map. his expression puzzled. Mumei tries to convince Ikoma to just leave her, saying that she’s weak and deserves to die. He asks that if weakness is the justification for death, “Then when can the weak become strong?” Then she tries to rally, saying she’s not weak and that she’ll get out of this and take out the Kabane. But Ikoma wasn’t having any of it, and as they’re arguing, Mumei’s heart begins to glow and she beings to panic, afraid that she’s about to turn into a Kabane. 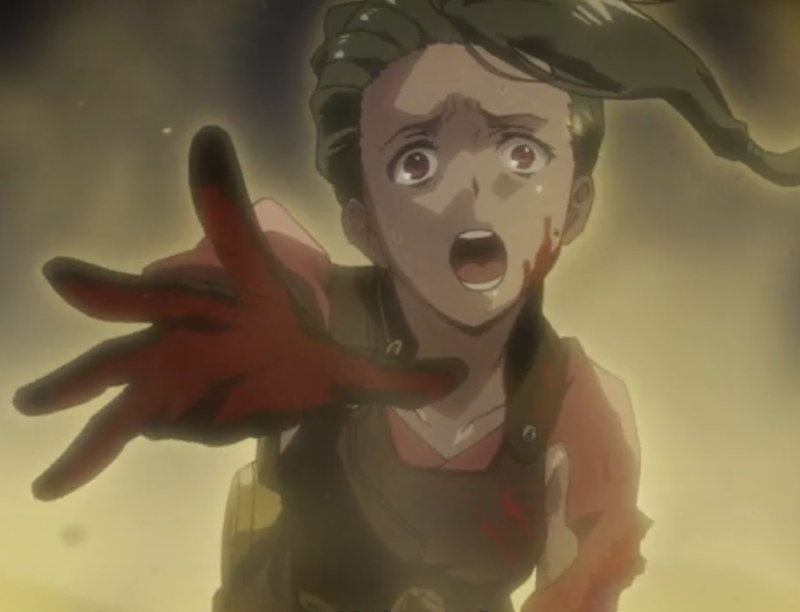 Ikoma gives her a vial of blood that he had brought with him, and her panic recedes as her strength returns. She tells him she really doesn’t know if she’ll turn into a Kabane if she gets too hungry, but in the past, she watched as the rest of her team turned. The memory haunts her. They hear a large group of Kabane approaching from farther in the tunnel. Ikoma goes to face them, telling her first that he’ll come back to dig her out, and second that they’re both weak. Exhausted, she tearfully accepts his judgement, but then finds new hope when he says that they can’t use that as an excuse to give up. As he runs off, Mumei passes out and relives another memory. She’s running beside her mom as the city around them falls to the Kabane. One of the bushi, overcome with fear, accuses everyone he sees of having been bitten. He tries to shoot Mumei, but her mom throws herself into the bullet’s path and dies. It took Mumei’s brother firing an arrow to save Mumei. 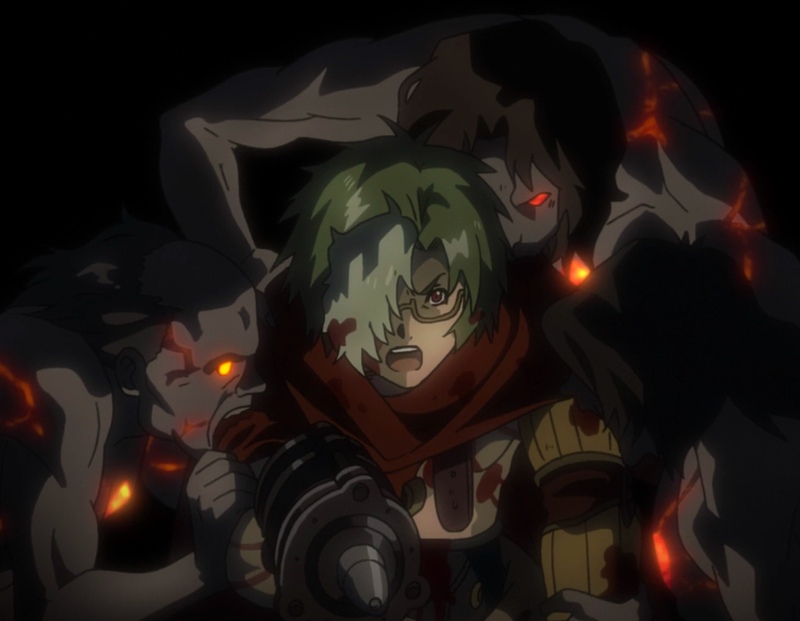 Ikoma has his hands full — and then some — trying to keep the Kabane away from Mumei. Capture from the Amazon Prime stream. Ikoma tries everything to keep the Kabane back. Using the suicide pouches as shaped charges, he blows a stack of steel beams into the Kabane; he engages them one by one. No matter what he does, though, they seem endless. Still partly unconscious, Mumei sees a small section of the roof above her peeled away. A crane pulls the rubble off her. When she regains full consciousness, she sees Kurusu, Kibito, and some other bushi. Ikoma is nowhere to be seen. She springs to her feet and searches for him, the bushi following. They are astounded at the heap of dead Kabane Ikoma left in his wake. The bushi are not prepared to believe Ikoma was responsible, but Kurusu confirms it: they were all killed by a single shot to the heart. Only Ikoma’s steam gun has that kind of capability. She finds Ikoma face down in a pool of blood. He’s visibly torn up, and dead Kabane surround him. She’s relieved when she learns he’s alive, but she still can’t understand why both of them are lived through this. They’re both so weak! Saying he’s in too much pain to think about such a heavy topic, they return to the Koutetsujou. As they exit the tunnel, they see that the Black Smoke of Kabane has reformed and is approaching. Mumei tells them it’s real name: a Fused Colony. A single Kabane acts as its heart; only by blasting away the top layer of Kabane and exposing the heart will they have a chance of defeating it. Boarding the train, they learn that Sukari had seen a huge gun turret when he and Takumi had tried to operate the huge steam crane. That’s why they had a crane to lift the debris off Mumei: the train had gotten close to retrieve the gun so they’d have a chance against the Fused Colony. Ikoma apologizes and promises to help to repay their rescue. The Fused Colony busy feeding on the dead Kabane, our heroes have time to work on their plans. Ikoma uses the central steam crane to move the toppled tower that was blocking the tracks. Mumei seems so happy to have a new lease on life that she apologized to the child who had lost his dog. Capture from the Amazon Prime stream. Mumei announces that she’ll repay their rescue, too, by being the one to strike the Fused Colony’s heart. 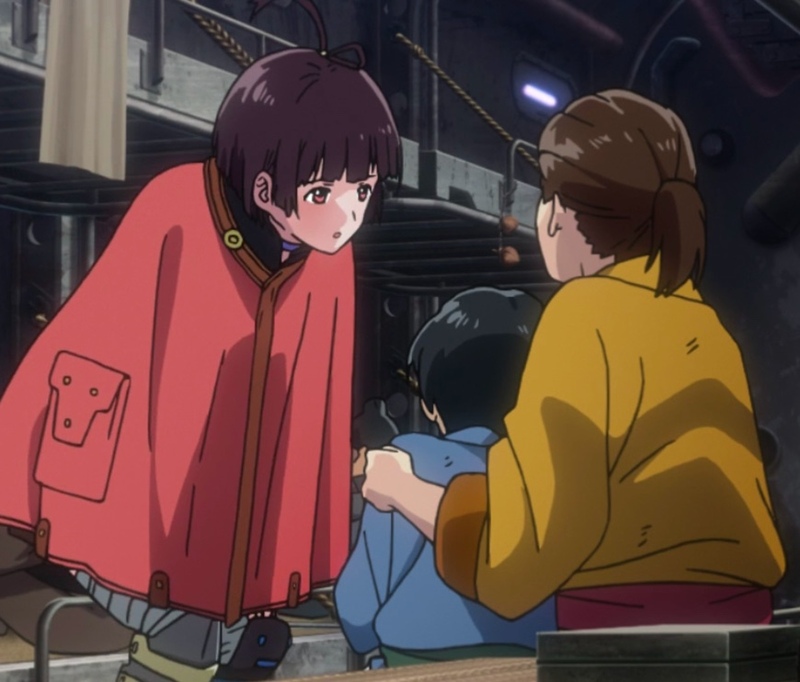 On her way to the back of the train, Mumei stops long enough to apologize to the little boy whose dog had died last episode. At about that same moment, the Fused Colony launched its attack and the Koutetsujou launched. From her ready position on top of the train, Mumei tells Takumi to draw the creature in close. Never having been in such a position before, he panics and fires; Kabane rain onto the train, and the bushi engage them. Kurusu casts off his bandages and says he’s about to use the sword that Ikoma reinforced for him; Ikoma tells him not to blame the weapon if he dies. The two of them help the other bushi defend the gun. The steam smiths reload the gun. Mumei stands by as Takumi takes aim. This time, Takumi allowed the Fused Colony to get close — very, very close — close enough for Mumei to reach it in a single leap. He fires. The shell strikes the Fused Colony’s heart and blasts away the outer layer of Kabane. Mumei leaps into the breach the destroys the heart. Ikoma has to catch her as the blast blows her towards the train. Free from the threat of the Fused colony, the train leaves the station. Ayame seems to be gaining confidence in herself. 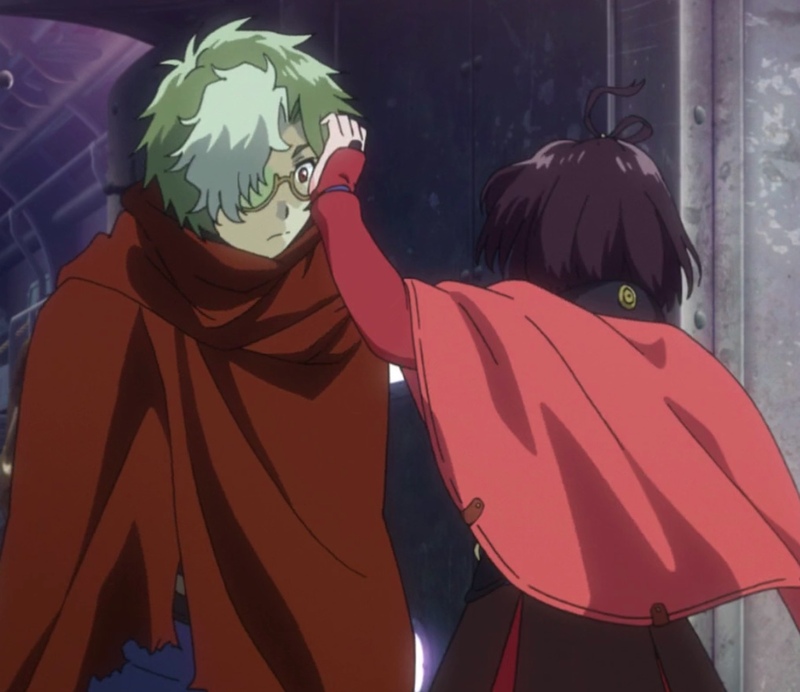 When the whiners tried to convince her to leave the Kabaneri behind, she shut them down and redirected the conversation in productive direction. It’s got to be hard on her leading a group like that! When Mumei asked to be left alone to die because she was weak, Ikoma asked what I thought was a very sensible question: “Then when can the weak become strong?” It seemed to resonate with her; it’s about time she came to terms with her own mortality! Mumei mentions that she’s never been bitten. I wonder, then, how she became a Kabaneri? Plus, we got to learn that everyone else in Mumei’s group turned into Kabane. I enjoyed seeing more of Mumei’s backstory in this episode. Saying they were both weak, Ikoma went further to say that weakness wasn’t an excuse to give up. That made me think of all of the failures he and Takumi had gone through to create the steam gun. I like Ikoma’s attitude: he understands that strength is only part of the equation of how effective they can be against the Kabane. There’s also intelligence, courage, and will. Even more than that, there’s something Mumei apparently has little experience with: interdependent teamwork. Before this episode, Mumei kept her feelings under tight control. This episode, she almost panicked three times: first just after she awoke for the first time, then when she thought she was turning into a Kabane, and finally when she found Ikoma unconscious. Between those moments and her buying into Ikoma’s philosophy of life, I think she mellowed a lot this episode. It’s good to see her learn that sometimes, it’s the connections we have with others that can project real power. An individual can only go so far without a team. Mumei was almost playful with Ikoma as she prepared to face the Fused Colony. Ikoma seemed almost shocked! Capture from the Amazon Prime stream. Mumei can’t just tell Ikoma that he did a good job. She has to smack his forehead first. I thought she showed real growth in this episode, and yet she remained Mumei. That’s good writing, I think! I like Kurusu’s slow transition from Ikoma’s enemy to ally — even if it’s an uncomfortable alliance! Kurusu seems honestly devoted to Ayame, and his attitude toward Ikoma until now was understandable, if annoying. Now that Ikoma has proven himself, Kurusu has accepted him as a warrior. When the Fused Colony exploded after Mumei killed its heart, it expelled Mumei. Ikoma had to catch her, but she wasn’t helpless or unconscious — she just needed help not skidding off the train. In other words, she had come to rely on Ikoma, but she wasn’t a helpless waif. In spite of his help, she was still Mumei. Just a little wiser. That’s not an evasive maneuver! That’s a left turn! In the last episode, we saw the main boiler complex explode. In this episode, we saw several shots of the mostly ruined building. So, how did the central steam crane still operate? It needed steam from that boiler. The shot showed a little smoke trickling from one of the stacks, but there was so much damage, I found it hard to believe that the boiler could provide any power. Yukina in action — because, well, Yukina! Capture from the Amazon Prime stream. Okay, I don’t want to see ungrateful, but why does Yukina take off her outer shirt when she releases the pressure limits? If that should have blasted her with hot air or even steam, shouldn’t she have kept her shirt on to protect her skin from scalding? Like I said, I don’t want to seem ungrateful — Yukina apparently takes very good care of herself! — but that moment felt forced to me. I know I should just let myself geek out at the coolness of the whole fight sequence, but the editor in me complained about the big glowing blue light that marked the Fused Colony’s heart. A huge beacon — that conveniently marked the Fused Colony’s only weak spot? Really? Of course, without that, Takumi wouldn’t’ve had a target. I struggled to see it as realistic, but you know what? I also struggled to care. The music, the pace, the animation — the sequence was still a blast to watch! Until this episode, Mumei’s mantra had been living through strength. She was strong enough to survive, and she had to prove it to herself again and again. Anyone who was weak deserved to die. In fact, she seemed to view death as evidence of weakness. 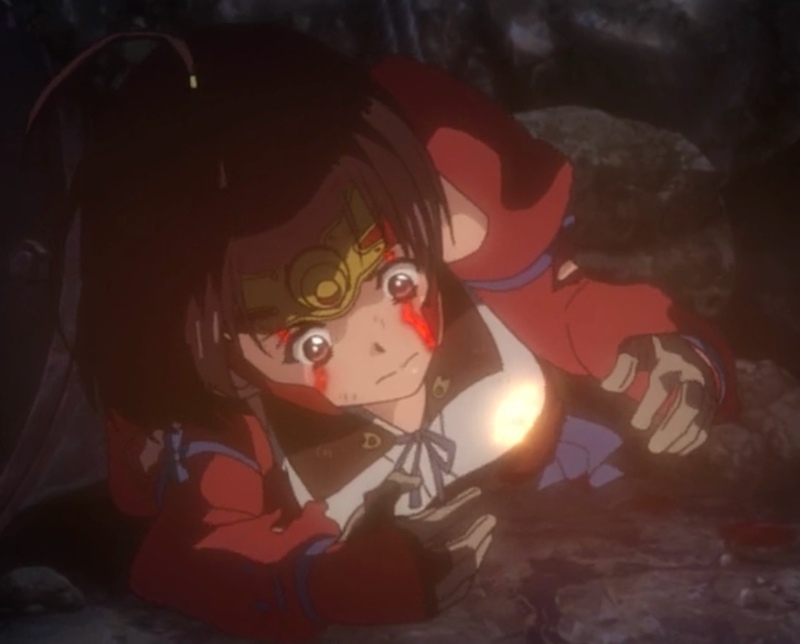 At the beginning of this episode, Mumei found herself trapped under rubble. She vacillated between admitting her weakness and protesting her strength, but she seemed to know that according to her own beliefs, she should die. Mumei, exhausted and hungry, begins to panic as her heart suddenly glows. Capture from the Amazon Prime stream. I’ve seen a lot of anime built on the theme that the strong deserve power and accolades, with the implication that the weak don’t. The thing about that philosophy is, how are they defining strength? Is it physical? That strength varies by age, exercise, and other factors. Money? That’s dependent on a huge variety of factors, some positive (providing a good product at a good price), some less so (ripping folks off). There just isn’t a universal description of what strength means, at least no definition that answers the question of who’s fit to live and who deserves to die. Mumei, apparently in reaction to her brother, tried to live according to physical strength. That failed, and not only did Ikoma have to protect her, but humans — lowly, weak humans — had to extract her from the rubble. I think Ikoma gave her something as important as protection: he gave her a new philosophy of life. Ikoma doesn’t care who deserves to live or die. The question isn’t something that’s even interesting to him. No, he’s going to save everyone from the Kabane. Everyone. Not those “deserving.” Not those held in high esteem. Ikoma will do what he can to keep every living human alive. As we’ve seen so far, he’s willing to pay a huge price for his belief. I think it’s no coincidence that Mumei was in elevated spirits in the latter parts of the episode. She playfully flicked Ikoma’s forehead and told him he’d done a good job; she apologized to the little boy for how she spoke about his dog dying; she even seemed almost jovial when she told Takumi that his first shot was way too early. She seemed that she felt free. It seems she’s embraced Ikoma’s view of their world. Now, I wonder how her brother will react to that?